I Hate Running Backwards (“IHRB”) is a fast-paced arcade shooter that will invoke nostalgia and the same zeal for a high score that kept 80s kids pumping quarters into arcade slots for hours on end. This title draws its inspiration from an easter egg hidden in first-person shooter Serious Sam, wherein Sam would comment how he hates running backwards, if one forced him to backpedal for long enough… and so in a cruel twist of irony, Sam and a cast of familiar action heroes are forced to run endlessly backwards in this top-down scrolling shooter. It is being published by Devolver Digital for PC, Xbox, and PS4, and is the first major release from Croatia-based developers Binx Interactive. IHRB is expected to also release for the Switch later this year. The gameplay for this title is deceptive — it appears simple, but quickly reveals a surprising amount of depth. The player can move their gun-slinging, one-lining hero all over the screen, collecting over forty special weapons, ammo for the hero’s two gun options, and various power-ups as they run. The player will be pursued by an army of various monsters that each require a different strategy to be done away with before they take away one’s precious few hearts. If all else fails, melee is an option, and in fact, the player will soon be spinning their hammer to destroy, well, everything. 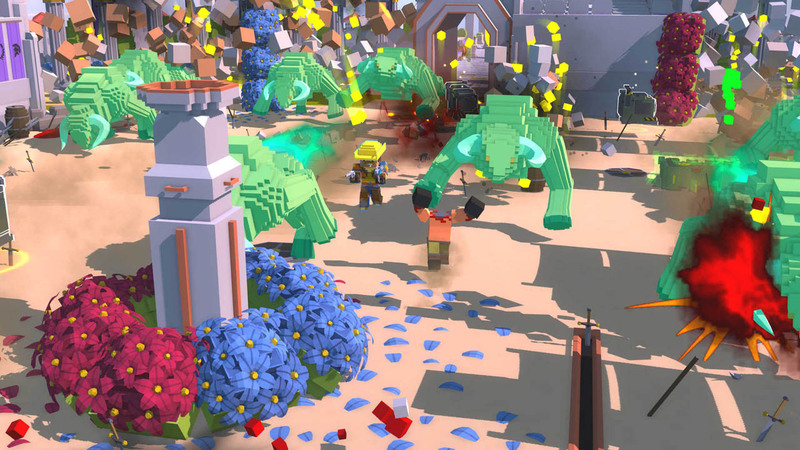 The map is procedurally-generated, and completely destructible, which lends itself to unique and interesting plays, even given the same game structure every time. There are six bosses to be defeated, each leading to a new set of monsters and environments when they’re slain. Once all have been destroyed, the player will start back at the beginning stage, but with all of the monster varieties now coming for them, and encounter the same bosses that have acquired nasty new tricks. Somehow, IHRB manages to keep the same set of bosses — in more or less the same setting, and with the same monsters — thoroughly entertaining and addicting. IHRB’s graphics are blocky (reminiscent of Minecraft) but are very well done and fitting for this title. While by no means a visual masterpiece, IHRB has a fun cartoonish vibe that is complemented well by its original scores. All said and done, the game runs smoothly, free of any glitches or bugs that plague so many releases in today’s development culture. With such a near-perfect experience, one can only expect to find microtransactions or paid day-one DLC to mar an otherwise unblemished title… and yet neither of those exist in IHRB. Refreshingly, you get what you pay for with this title, and while there are no expansions planned in the near future, the developers have been incredibly active with their burgeoning community, adding features and balancing the game at an impressive rate for such a small studio. There is truly only one area where IHRB will frustrate its players, and that lies within the classic arcade-level of difficulty. This release suffers no fools, demanding your full attention and quick reaction times to get anything close to a high score. Simply put… Sam and co. are going to die a lot on the journey to “gittin’ gud.” Case in point: it took me seventeen hours to finally kill the first boss — but with great difficulty comes even greater satisfaction. There is an experience system (called “mojo”) for each play, so the hero will rise to the occasion with cool new abilities as one progresses, but even one mistake can see one’s character exploding into little red cubes. Progression is rewarded with new heroes to play as, and new special weapons to wield, but these can stay gated for quite some time as the player learns the ropes and works up to not dying in the first minute or two. Post-release, a Baby Mode has been added, but it only serves to assuage the daunting difficulty to a minor degree. IHRB can be played cooperatively with two players on the same system, or over the internet on PC via a service called Parsec. There are currently no plans on a true multiplayer experience, but there is a “Kill the Streamer” mode for Twitch, where viewers can spawn monsters into the poor steamer’s game from chat. IHRB is not a triple-A title, it is very much a one-trick pony, and it doesn’t necessarily catch the zeitgeist of today’s game scene. However, it does not pretend to be more than it is, and it does a fantastic job of being an engaging arcade shooter. Its replay value is massive, and it can be enjoyed by gamers of all ages. Unless you’re prone to violent fits of rage, I would highly recommend that anyone and everyone check out IHRB, as it is well worth its price tag. Kyle is a computer science student at the University of Arizona. He fell in love with gaming as a child when he built his first computer, getting sucked into many MMORPGs. Today, he enjoys playing FPSs, turn-based strategy games, and MOBAs on a myriad of platforms. When he isn’t glued to a screen, he enjoys practicing mixed martial arts, playing the viola, and backpacking throughout the American northeast.